This entry was posted on Friday, February 27th, 2015 at 9:12 am and is filed under Uncategorized. You can follow any responses to this entry through the RSS 2.0 feed. Both comments and pings are currently closed. Great idea. We’re assuming pretty much the 1976 band plus A Guitarist? a funkier version, Bowie’s hooked up with Worrell for the next few years. it was a short gig tbh. If I recall, at that concert, he left the entire set to his friend Philip Glass who premièred his full orchestra tribute, the “Laughing Gnome Symphony”. The last time riots like that were seen was Stravinsky’s Rite of Spring. His “Heroes Symphony” later was a little better received by audiences. In the interest of making this something of interest for you to sift through, do you, col1234, prefer we stick to existing titles in the repertoire, or do you allow license to include “new” songs from an imagined narrative? some really good entries already! this will be hard to choose. But wait! Doesn’t he play “Blackout” in your fictional entry as well? he does. should amend to say: if you can get a Low or Heroes song in there that makes sense (i.e., it’s something DB could’ve written regardless of location & collaborators) go for it. I would love to heard a ”funky” version of Sweet Head. Personally I don’t think he could have survived another year in LA. Marc’s death may well have proven too much to take that year. Thanks for all the responses so far! Some really, really inspired ones. I don’t know why, but I absolutely lost it when I read this. I think you win. Seriously, this is so good I’m not sure I’m going to enter now. The setlist of my dreams. You deserve to win. I really want this to win, I think even DB himself would find it hilariously insane. The underdog of setlist entries. Thank you all! It’s just that I love Outside so much and there is so much unreleased music from Outside sessions (all these long avantgardy jams) that I thought it would be cool if Nathan Adler made a timetravel to the past with this performance as a part of his investigation. Nevermind the Disco King…Here’s David Bowie! including the ones left in the comments, I’ve got 42 entries as of mid-Wednesday. Two more days to enter! Low and Heroes are so integral to the essence of 1977 that this is a tough exercise… in fact it’s testament to the trajectory of Bowie’s career that it’s *really* tough. This is the parallel bowieverse where Elvis records golden years in early 76 and it makes his “mature years” career, he becomes the hippest act in the world. DB cleans up and does Vegas, guesting often with the King, before they tour the UK together in late 76. By the time they hit MSG for the final dates of the US leg of the tour, Elvis’ “ELVISCHANGESNOW” and DB’s “The Young Americans Get Down at Muscle Shoals” albums are battling each other for the number one slots on both sides of the pond, while their joint CBS TV special “The King and the Duke – A Hollywood Clambake”, has beaten The Beatles’ Ed Sullivan audience. On stage at MSG LizTaylor introduces the band: Alomar-Murray-Davies-Scotty Moore-Bobby Womack-Garson-Sweet Inspirations. because I love you too much, baby …” a little something he worked up with Luther and Ava at Sigma Sound..
Will mention though, that I see coordinates here –Liz Taylor and Stevie Wonder– for a double duet wherein Stevie introduces a new number he’s working on called “I Can’t Help It” and– brings on Michael Jackson for that number. And it adds another dead person to the parallel world. Maybe there’s a way to work out a drinking game here ? This has probably been posted before here ? but for a bit of fun this is as close as we are going to get to a DB/Elvis late 70s duet. The Liz Taylor addition is a wonderful period flourish. Yes, without question. Think I was there this night ..
Then the crowd-pleaser finale, Iggy Pop comes on, for what else, “The (crème) Brûlée Brothers” with DB on accordion. Amazon inform me the book is in the post. 1. 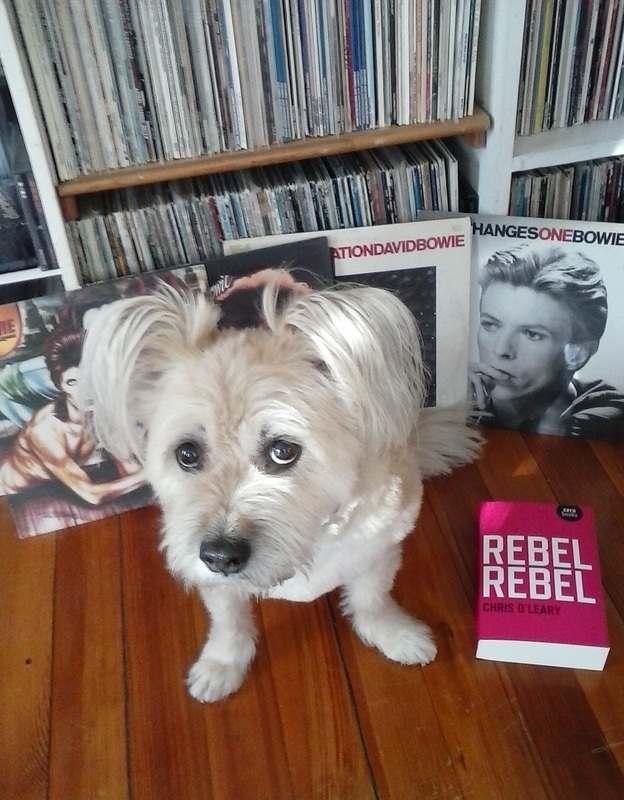 Will Rebel Rebel replace The Complete David Bowie as the bible? 2. How the hell will the rest of Bowie’s songs fit into the 2nd volume?? 2. They won’t. There will be a third set, called ‘Three-roes’. Um, Probably. Lower Third indeed. And don’t call him Shirley. I can’t even begin to imagine the ominous dread Chris must feel every time he remembers that he has to write about every single Tin Machine song again. Hunt Sales’ “Sorry” will never have sounded so appropriate.